More Than Just A SAHM: YUMMY magazine kicks off December with Yummy Cooking Demo! 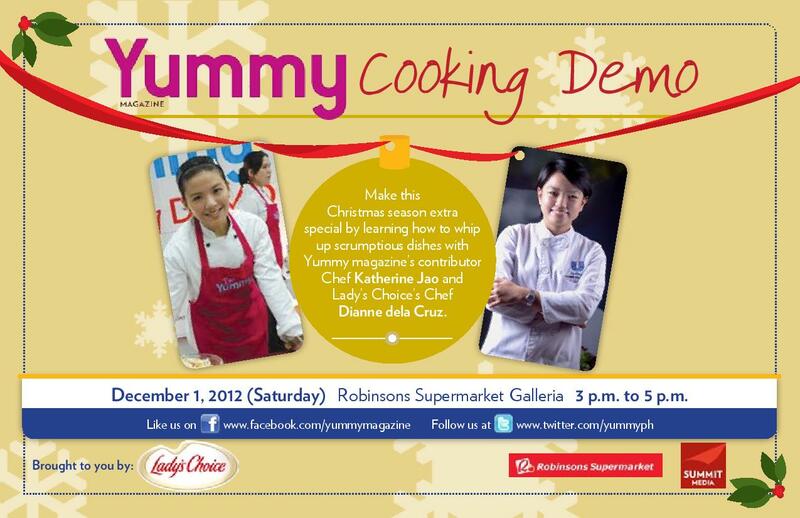 YUMMY magazine kicks off December with Yummy Cooking Demo! Last December 1, food lovers trooped to Robinsons Supermarket, Galleria for the Yummy Cooking Demo with Lady’s Choice and Yummy magazine. This was a Noche Buena themed cooking demo to start off the Christmas month with a delicious headstart! Loyal YUMMY readers and shoppers alike were able to learn easy-to-do, mouth-watering dishes that the family would truly enjoy. Aside from the exciting cooking demonstrations, the participants also had a chance to win awesome prizes courtesy of YUMMY magazine, Lady’s Choice, Masflex Cookware and Fujidenzo! YUMMY’s contributing chef and food artist Chef Katherine Jao demonstrated three sumptuous recipes from the December issue’s “A Holiday Feast” spread—sure-fire mainstays at Christmas gatherings this month. Two special recipes from Lady’s Choice were also demonstrated by Chef Dianne dela Cruz. Among the dishes prepared were Baked Lapu Lapu, Clam Capellini Pasta and Christmas Fried Rice. Yummy Cooking Demo was made possible thanks to Lady’s Choice, YUMMY magazine and the venue, Robinsons Supermarket. YUMMY magazine is a publication of Summit Media and is available in newsstands, bookstores and supermarkets nationwide for only P125. Be part of YUMMY magazine’s growing online community by visiting www.YUMMY.ph, liking us on Facebook via Facebook.com/yummymagazine, and following us on Twitter via Twitter.com/yummyph.